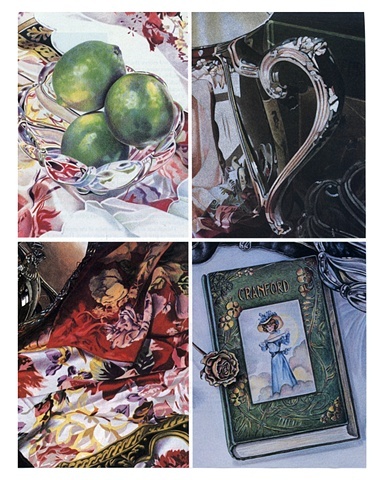 Take Four$, is an article which appeared in American Artist Magazine by Marilyn Rabetz on the subject of creativity in Colored Pencil Still Life. Working with Janie Gildow, Barbara Edidin and Barbara Benedetti Newton (fellow colored pencil artists) the group produced twelve paintings for the article that were later exhibited in the Sue and Eugene Mercy, Jr. Gallery in Windsor, Connecticut. This page shows elements from each artist's painting for the first set. There were three rounds of paintings completed.